An overview of the services MSF teams are currently providing in Misrata, Benghazi, Zintan and Yefren. An MSF staff member conducts a training session for Libyan medical personnel in Misrata's Kararim Advanced Medical Clinic. Doctors Without Borders/Médecins Sans Frontières began its activities in Libya on February 25, 2011. MSF teams are currently providing medical assistance in Misrata, Benghazi, Zintan and Yefren. Five months after the start of the Libyan conflict, the frontlines have moved several kilometers away from Misrata, but heavy shelling continues to dominate daily life in the city. As the seaport is the only remaining avenue through which to bring in supplies, the city remains largely enclosed. MSF continues to support medical facilities, to assist and train health staff who are carrying out most of the work in the relief efforts in Misrata, and to provide mental health care. Today, the MSF team is made up of 44 Libyan staff and 30 international staff. In the late afternoon of Saturday, July 30, ten wounded people arrived in less than one hour at Qasr Ahmed Hospital, where MSF surgeons are supporting local medical personnel. Two of the wounded were severely injured; one with heavy burns on his body and another who was immediately sent to the operation theater for a leg amputation. War trauma surgery is currently the main priority for Libyan medical staff, which is creating significant gaps in other areas of care, such as obstetrical and pediatric care. Another challenge is the lack of paramedical and hospital staff. The Libyan health system was very dependent on foreign nurses, midwives, and other hospital staff who fled once the war began. Junior doctors, medical students, and others with less training volunteered to fill the gaps as best as they could. In response, MSF initiated a series of trainings on war surgery, hygiene, sterilization, bed-side assistance, and waste management. Misrata’s health facilities are also facing shortages of drugs and medical supplies (e.g. sterilization machines, incubators, monitors for intensive care units, oxygen concentrators, laboratory reagents) due to the long-standing fighting in and around the city. Since the beginning of its activities in Misrata on April 18, MSF has been supporting local medical staff in four health facilities: Qasr Ahmed Hospital, Abbad Hospital, Ras Tubah Medical Center, and Al Noor Hospital. In Qasr Ahmed Hospital, MSF is supporting the Libyan medical staff with a team of two surgeons (one general surgeon and one orthopedic surgeon), two operating theater nurses, and one anesthetist, who together are in charge of the emergency room, the two operating theaters, and the inpatient department. Over the past two months, the MSF team performed 200 surgical interventions. In July, 90 percent of the interventions were related to war surgery. The team is on call 24 hours a day, seven days a week. A mass casualty plan training has been organized for all hospital staff. Abbad Hospital is one of the main health facilities treating war-wounded in Misrata (along with Central Misrata hospital and Al Hikma Hospital). A referral system has been created between Abbad Hospital and Qasr Ahmed Hospital in order to refer war-wounded patients requiring surgery when bed capacity of Abbad Hospital is overloaded. When requested, MSF surgeons support Abbad medical staff to treat war wounded. Ras Tubah Hospital is a former fertility clinic that has been adapted into a maternity and pediatric hospital. MSF created a sterilization room, an intensive care recovery room for maternity cases, a laboratory, and a waste management area. MSF has also increased the hospital’s bed capacity by setting up new pediatric and newborn wards. The MSF team—a gynecologist, an operating theater nurse, and a pediatric nurse—is supporting medical staff for maternity, gynecology, and obstetric care. More than 520 deliveries and 80 caesarean sections are carried out each month. In Ras Tubah Medical Center, an MSF doctor and nurse are training local staff and are supporting the five-bed intensive care unit, assisting women with maternal care complications. In Al Noor Hospital, a facility located northwest of Misrata towards the northern frontline, MSF has opened a four-bed intensive care unit and is providing drugs and medical equipment to the operating theater. A doctor, an anesthesiologist, and two nurses are training the hospital staff on a new mass casualty emergency plan. MSF has also provided training and medical supplies in the advanced health posts near the main frontline in Dafnya to the northwest, Kararrim to the south, and Abdel Rauf, to the west. The structures are properly equipped and the personnel are highly skilled. MSF provides training on basic life support, stabilization, and war surgery, and provides autoclaves, oxygen, spinal boards, burn kits, dressing kits, chest tubes, pain medication, antibiotics, and other medical supplies. As the war grinds on, more and more people in Misrata find themselves suffering from psychological trauma. To help them cope, MSF has set up a mental health program. Two MSF psychologists are working in close partnership with a network of 30 Libyan psychologists to provide both individual and group consultations in 11 health facilities, including hospitals, clinics, and physiotherapy centers. In addition, MSF has organized a weekly training session for psychologists so they can share experiences of detecting trauma and providing relaxing techniques to people in need. A crucial component of the program is its “community approach," which consists of identifying social networks in order to support people affected by the war, such as women who have been displaced with their families or who live in highly damaged parts of the city. MSF also provides psychological support to Libyan health staff and psychologists confronted everyday with horrible stories shared by their patients. Together with local medical personnel, MSF began assisting detainees in the civil and military prisons of Misrata, focusing on primary health care and assistance to war-wounded. The team is also assessing the needs for physiotherapy and psychological support among prisoners. MSF has carried out an evaluation of the needs for physiotherapy and rehabilitation for wounded patients in Misrata’s health facilities. Training and support will be provided to local physiotherapists in Qasr Ahmad and Abad Hospital, and in prison to increase the local health system’s capacity in this domain of care. MSF began working in western Libya in March. From late April until mid-June, MSF provided support to the hospital of Zintan and treated more than 270 war-wounded people, including 70 patients in severe condition. As the frontline shifted, MSF began supporting the hospital of Yefren in mid-June. To date, the medical team, which includes a general surgeon and an orthopedic surgeon, has seen a total of 309 patients, of which 180 were war-wounded and 26 required surgery. The team also provides emergency response training to the medical personnel in order to improve the response to a mass influx of wounded people. MSF also supports primary health care activities. 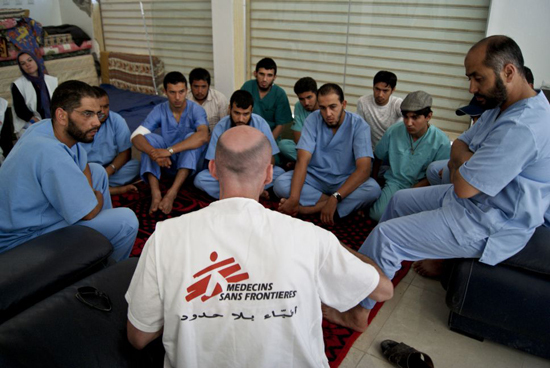 In July, MSF began a mental health care program in Zintan, offering psychological support to hospitalized patients, as well as to medical personnel, who have been under immense pressure for the past several months. The main problems detected are depression and anxiety related to traumatic events, grief, and loss. A total of 94 consultations have been carried out so far. MSF teams also reach out to people living in surrounding communities through public awareness and community mobilization. MSF is currently expanding its mental health activities in Zintan and Yefren. MSF arrived in the city of Benghazi on February 25. Today, MSF provides antenatal care and gynecological assistance in the Sultan and Madroun Clinics, where approximately 100 consultations are performed on a weekly basis. MSF teams also provide antenatal care training for the staff of Ajdabiya and Jamahyiria Hospitals. A mental health program for people traumatized by the war supports and trains a network of more than 40 Libyan psychologists. Individual consultations are carried out in Sultan Clinic, El Jamharia Hospital, Pediatric Hospital, Benghazi Medical Center, Al Jallah Hospital, and in displaced persons camps such as the Al Nahar Camp, Alhan Becum, Libyan Society for first Aid and Response Camp, Arab Medical Camp. MSF is an international medical humanitarian organization that has been present in Libya since February 25. To ensure the independence of its medical work, MSF relies solely on private financial donations to fund its activities in Libya and does not accept funding from any government, donor agency, or from any military or politically affiliated group.